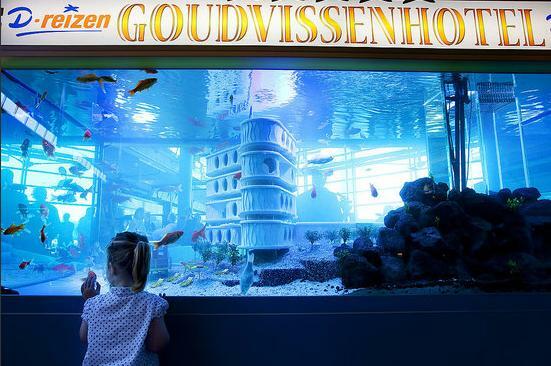 Netherlands residents now have a place to watch their fish when they go on vacation. It's the world's only fish-resort. My question is how can they stop the fish from fighting each other? It's just an aquarium at the Schiphol Airport in Amsterdam advertising for a Travel Agency (D-reizen). You can't actually leave your fish there or anything. From the photos, it's aquarium decoration to look like a hotel underwater. Not actually some place where you take your fish when you go on vacation. At least I'm hoping it's just that and someone wouldn't be stupid enough to drop their fish off. That's just asking for trouble. You don't know the temperment of the other fish in the tank. You're stressing your fish out moving them to this tank, increasing their risk of getting sick. And you don't know what kind of diseases these other fish are carrying. PLUS you're putting your fish in to a tank where people walk by it (and probably idiots tapping on the glass), constantly stressing them out even more. Just straight up retarded idea if it is a place for people to drop off their fish. It beats flushing them down the toilet, but it's only for goldfish. "The First Hotel For Fish"